Within the framework of the European Week of Regions and Cities, AP Vojvodina hosted the traditional reception on 8th October 2018, whose guest was David McAllister, EU Parliament’s rapporteur, Franz Schausberger, Chairman of the CoR-Working Group Western Balkans, Ana Hrustanović, Ambassador of the Republic of Serbia to the European Union, moreover MEPs, representatives of EU institutions, a number of regions and cities, as well as the business community. 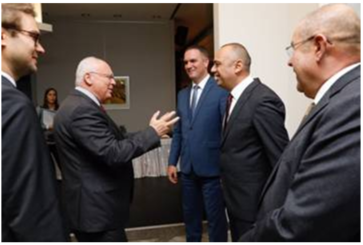 The hosts of the event, which took place at the Mission of the Republic of Serbia to the EU, were Đorđe Milićević, Vice-president of the Provincial Government, István Pásztor, President of AP Vojvodina Parliament, and Ognjen Bjelić, Provincial Minister for Regional Development, Interregional Cooperation and Local Self-Government. The event “Vojvodina, Great for Business, Great for Life“, was organized by the European Affairs Fund of AP Vojvodina and the Vojvodina European Office in Brussels, with the support of the Vojvodina Development Agency. Đorđe Milićević, Vice-president of the Provincial Government, emphasized that Vojvodina had made an excellent step, and that the presence of a large number of officials from European institutions testified that Serbia and Vojvodina were on the right track and that the reforms implemented in Serbia were successful. “I believe that we’ve managed to present all the potentials, of which there are a lot, in the best way possible, and tonight’s reception shows that the reputation of Serbia and its province of Vojvodina is high,” said Vice-president Milićević. István Pásztor, President of the Assembly of AP Vojvodina, underlined that Vojvodina had a lot of friends among the European regions and that it was of common interest to build partnerships and trustworthy relationships. He added that common ideas related to joint projects allowed European regions to progress.